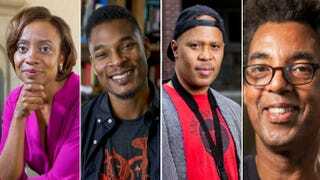 Four black Americans will be among those receiving a no-strings-attached, $625,000 stipend—paid out in installments over the next five years—to keep doing what they do best: being geniuses. That’s right, the MacArthur Foundation named 21 “extraordinarily creative people” as the 2014 recipients of its annual MacArthur Fellows Program—widely referred to as the “genius” grants. Four African Americans are among this year’s consortium. These individuals were nominated by an anonymous and esteemed group of people who are experts in their fields. The fellows had to demonstrate not only that they are brilliant self-starters in their respective professions but also that they are pushing the limits on future work that has “the potential for the fellowship to facilitate subsequent creative work,” the foundation’s site reads. Jennifer Eberhardt, a social psychologist investigating the subtle, unconscious ways that people racially code and categorize others, with a particular focus on how race and visual perceptions of people affect policing and criminal sentencing. Rick Lowe, a public artist using art to reimagine and revitalize struggling communities. His program has transformed derelict properties in Houston’s predominantly African-American 3rd Ward into a visionary arts venue and community center. He has since begun similar work in other cities, including current projects in Dallas and Philadelphia. Steve Coleman, a jazz composer and saxophonist infusing traditional jazz with an eclectic range of other musical styles, including music from West Africa, South India, Brazil and Cuba. Terrance Hayes, a poet crafting musical, almost improvisational, verse that delves into issues of race, gender, current events and family. He often uses humorous wordplay and references to pop culture, including poems that speak in the voices of David Bowie, Jorge Luis Borges and Strom Thurmond.